I have to admit that I’ve gotten off to a slow start with the Wine Book Club. I still have yet to post my review of Wine and Philosophy as part of the first “spin the bottle” round and I never cracked open the first selection, Vino Italiano. Kudos to David McDuff for a great job hosting the first edition with a great turnout. I hope to carry forward this momentum and now announce the next book in our series. Bordeaux has always been a benchmark for me as these were the first wines that all the books said I should appreciate when the wine bug first bit me in 1980. After literally cutting my teeth with their wines of the 1970’s (not always too much fun) I fully recognized the importance of Bordeaux when the first 1982’s were released. By then, of course, I was drinking mostly Napa juice but some of these Bordeaux spoke to me in a different way and I continued my wine education. 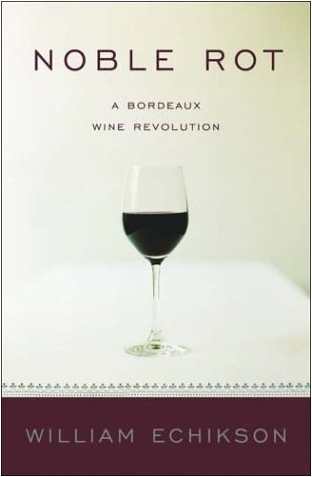 So the second edition of the Wine Book Club is focused on William Echikson’s Noble Rot: A Bordeaux Wine Revolution. I selected this book because it gives the backstory of what is wrong and right in Bordeaux in an engaging and very readable style. Also, since it’s been out for a few years, it’s very reasonably priced used and available at many libraries. So join me on April 29th and post your review of Noble Rot (the book, not the fungus). If you don’t have a blog, you can sign up at our new Wine Book Club blog and post there. I’ve been meaning to take a look at this book for a while, so I shall renew my efforts and try and get this one done on time! Anyway, looking forward to this one (it’s been on my ‘must check out’ list for some time now), will peruse it between diaper changes ;-). Thanks for the shout out, Tim. “Noble Rot” has been on my reading list for a while as well, so I’ll look forward to participating. Sounds like a great choice. Need to head over to Amazon right now! Hope you like the book. I think it will spark quite a few discussions here and elsewhere.